The right wing admits there is frustration among the players that they couldn’t score a try against France. Tommy Bowe is the new Cadbury ambassador. HOW OFTEN ARE we reminded there is value in losing? It can be hard to equate the sentiment with reality, but Joe Schmidt’s Ireland do appear to be partly driven by what happened to them on that infamous November afternoon in 2013. Steve Hansen’s All Blacks broke Irish hearts with a last-gasp try and re-taken conversion to steal a win in Schmidt’s third match in charge. Learn from it, move on and look ahead, we might think, but wing Tommy Bowe says that result is still very much in mind. Ireland are currently on a nine-game winning streak as they look towards England in Dublin on 1 March, a game that provides the potential to make it three wins from three in their Six Nations title defence. Last weekend’s 18-11 win over France provided some nervy closing minutes, as a Romain Taofifenau try brought les Bleus back within touching distance. However, Bowe explains that Schmidt’s men have built belief in their ability to close out games since their harsh All Blacks lesson. It does give huge confidence, probably on the pitch whenever we do get into a sticky situation,” says Bowe of what Ireland have garnered from their winning run. “Like at the weekend when France pulled it back and it could have been just that one score, they had us on the ropes, but we go back a lot to think about that All Blacks game. It plays in my mind still; could you have worked that bit harder in the last few minutes of the game to do whatever you could to stop them scoring that try? “That rings out in your head going into that sort of situation. Having the ability to know in the last five, 10, 15 minutes that we can pull something out of the bag if we need to to win is a huge confidence booster for a team. Despite the tough memories of that meeting with New Zealand in 2013, Bowe says Ireland also still take positives from their own performance. For the 30-year-old, that display remains the peak the side has reached under Schmidt. “I think our performance that day in the first half was probably the best performance under Joe Schmidt, I would say. The way we came out of the blocks in that first half was probably better than we’ve played since then. Despite Ireland’s success, most recently against the French, there remain rumblings of discontent from some quarters, although Bowe says “you kind of have to laugh” at any unhappiness on the outside. He’s been on the wrong end of the result against France for too long to take a win such as last weekend’s for granted. “Listen, it just shows where Irish rugby is and the expectation that’s out there,” says Bowe. “To have beaten two of the Southern Hemisphere giants in the autumn, people are wanting to see more and are expecting more of this Irish team. One of the concerns some critics have pointed to in the aftermath of the French victory was the lack of tries, and a total of zero clean breaks. Bowe underlines that any frustration at Ireland not crossing the whitewash is shared by the players themselves. “I think that players will be disappointed not to score tries,” says Bowe. “We didn’t have a huge amount of opportunities to score but in those two or three that we had, we’d be disappointed ourselves that we didn’t put them away. There were certain areas that were just not clinical enough and that’s been highlighted as something we’d be looking to address. 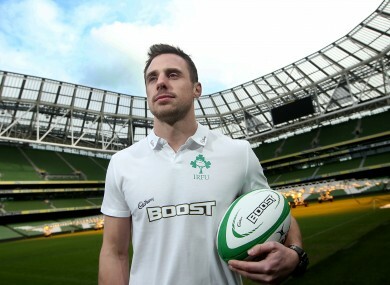 Cadbury Boost was unveiled by Tommy Bowe as the official chocolate bar of the IRFU and sponsor of Touch Rugby at today’s launch in the Aviva Stadium. To celebrate the sponsorship, Cadbury Boost is offering fans a chance to win a pair of tickets to watch Ireland take on England on Sunday, 1st March. To win just log on to the Cadbury Ireland Facebook page at www.facebook.com/cadburyireland. Email “'All Blacks defeat still plays on our minds' - Bowe confident of Ireland's progress”. Feedback on “'All Blacks defeat still plays on our minds' - Bowe confident of Ireland's progress”.